At AdvantaClean of West Knoxville, there are two main duct & vent cleaning services that we provide in the Knoxville, Tennessee area. The first of these services is air duct cleaning. If you and your family members consistently suffer from allergy symptoms or you have a hard time breathing when you’re indoors, your property could benefit from air duct cleaning. Using specialized equipment, our team will dislodge and eliminate dirt, debris, and other contaminants from your home’s duct work. This can improve your HVAC system’s efficiency and ultimately help you reduce your monthly energy bills. 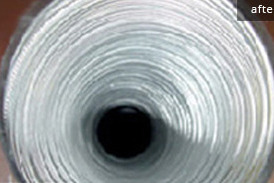 The second duct and vent cleaning service we provide is dryer vent cleaning. When your dryer vent is clogged, the internal temperature of your dryer may significantly increase, your dryer may use more energy than normal, and your dryer’s lifespan is compromised. We will thoroughly clean out your home’s dryer vent, so this appliance is able to perform effectively and efficiently. At AdvantaClean of West Knoxville, our duct & vent cleaning services are complemented by excellent customer service. We realize that we wouldn’t be where we are today without our clients, and we will strive to meet your duct & vent cleaning needs in a professional, friendly, and cost-effective manner. When it comes to duct & vent cleaning services, you can’t go wrong turning to us at AdvantaClean in, Knoxville, TN. For more information about our services or how we can help you improve your home’s comfort level, please don’t hesitate to give us a call today.